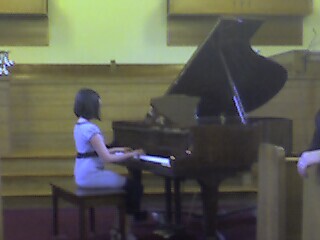 Eldest of Oz played Beethoven's "Russian Folk Song" for this season's "Entrata Music Club" recital. The Entrata is part of the Tennessee Federation of Music Clubs. Tomorrow both Eldest and Man-Cub will perform for the Guild judge. This will be Eldest's 3rd Guild critique, with ten (10) songs to be played from memory as they are called by the judge. UPDATE: I've uploaded the Treo-captured video to YouTube.